"Displacements & Reconstructions" at Henrique Faria, New York City. 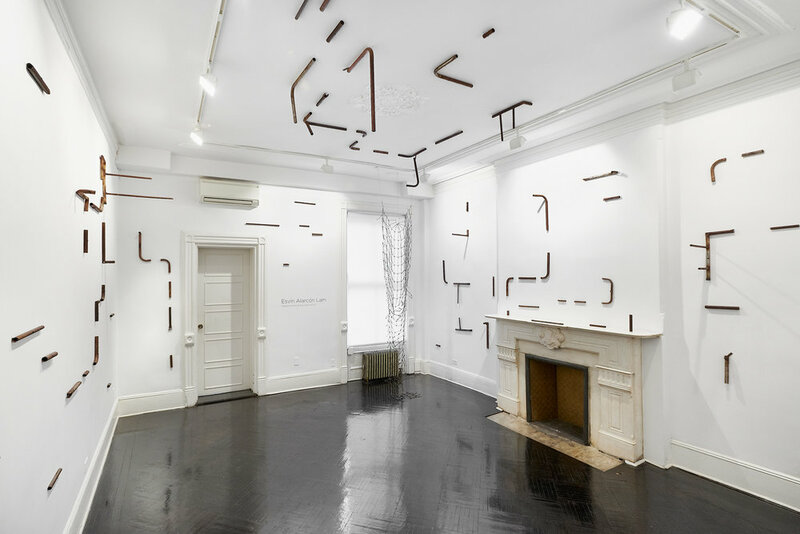 View of "Displacements & Reconstructions" at Henrique Faria Fine Art, New York City. Showcased at Henrique Faria Fine Art, New York City. In Guatemala City, Blue Birds are a common sight. Sold at auctions in the United States and driven down to their new environment, the iconic yellow U.S. school buses are then repainted by their new owners with vibrant colors and unleashed upon the city streets with a new role as a collective bus. Scraps from permanently retired buses find themselves transformed yet again in Alarcón Lam’s series Desplazamientos (Displacements) (2016-17). The word “displacement” implies translocation, shifting and also the consequences of such movement. 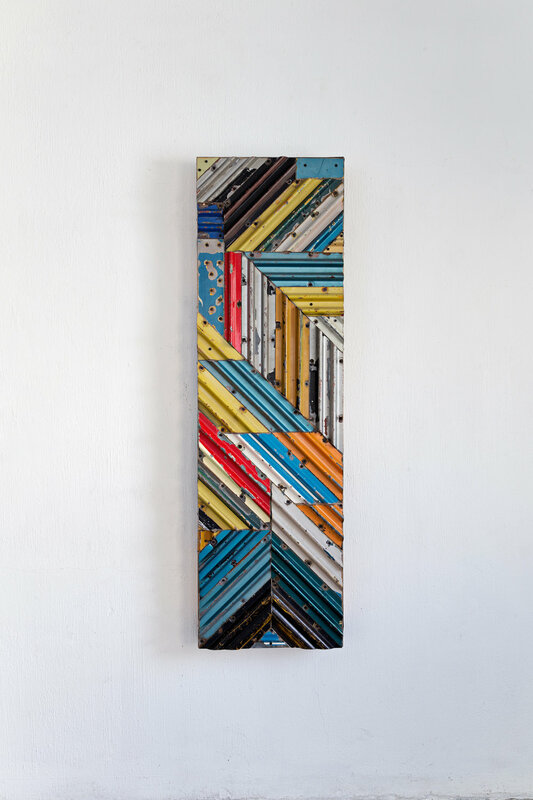 Alarcón Lam doesn’t hide the oxidation, the nail holes, the chipped paint, the evidence of their previous iterations, in his wall panels, where these scraps are integrated into a more harmonious geometry. 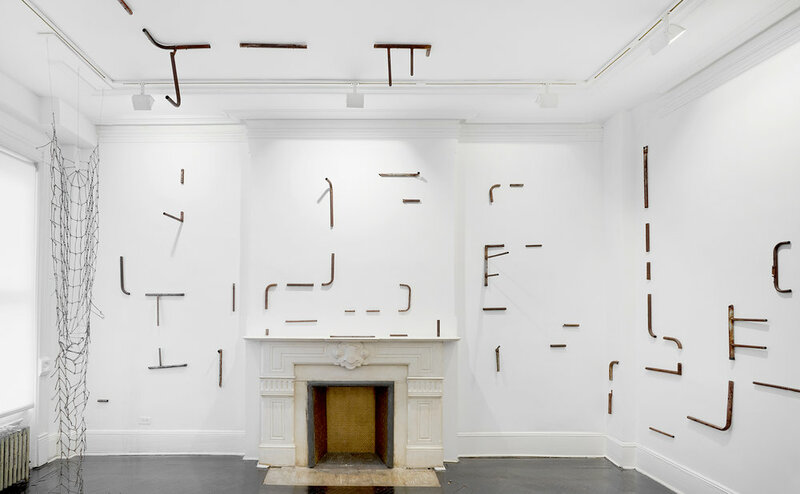 As Gabriela Rangel writes in the exhibition text, Alarcón Lam’s “exploration [of geometry] began as an expression of a general and pervasive positioning of contemporary artists towards Minimalism, regardless of whether they come from the periphery or the Global North.” Rangel continues, noting that the impartial sense of “objecthood”, which is normally endowed to minimalist artwork, is complicated in the work of Alarcón Lam due to the social and political nature of the material used. These works are not merely the shapes they come to resemble, but are also the sum of its various parts. Esvin Alarcón Lam (Guatemala, 1988) attended the Universidad Rafael Landívar and studied art at the Escuela Nacional de Arte in Guatemala City. 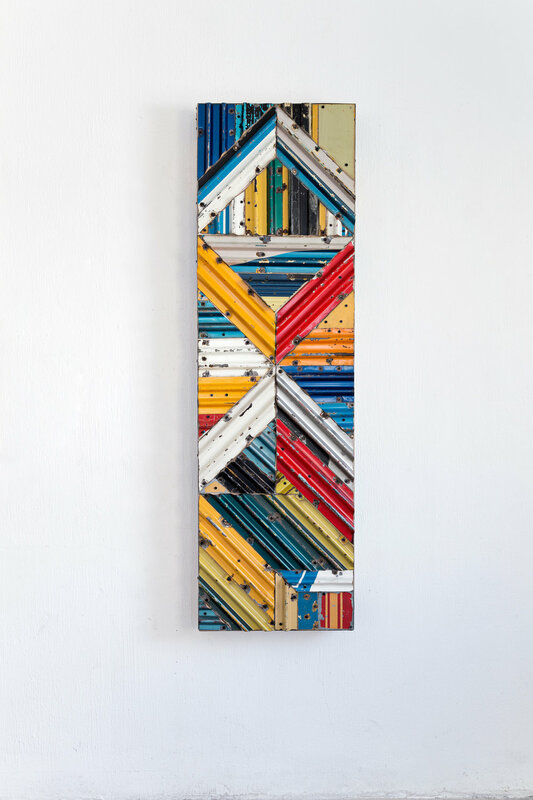 His work has been exhibited at the Osage Art Foundation, Hong Kong (2017); the Bienal de Arte Paiz, Guatemala (2016); SPACE Collection, Irvine, CA (2016); Materia Cruda, Galería de Arte de la Universidad Rafael Landívar, Guatemala (2016); Lineas de la mano, Sicardi Gallery, Houston, TX (2015); 5 Revoluciones por minuto, 9.99 Gallery, Guatemala (2015); Spatial Acts, The Americas Society, New York, NY (2015) and 5 dias: puertas abiertas, Centro Cultural de España, Guatemala (2013). His work is part of the public collections: SPACE collection, Irvine, CA and Fundacíon YAXS, Guatemala City. The artist lives and works in Guatemala.